Well, both steamboat parties I had were a great success. We had fun brainstorming what ingredients we should have (let’s just say my WhatsApp group chats were sounding non-stop!). It’s a dish that allows you to think out of the box and go wild with your creativity, plus its forgiving nature allows you to throw in just about any ingredient which cooks well in stock. Just to share a few of my must-haves, luncheon meat – surprisingly good in steamboat, quail eggs – unknowingly you would have popped no less than 10 into your mouth by the end of the meal, lastly there’s cheese tofu – it adds so much taste dimension and that playful squirt in your mouth. Oh, and how can I forget the best part, throwing in some home-made noodles to slurp up all the soupy goodness with. But what differentiates a good steamboat party from a Great steamboat party, it’s the base S.TO.C.K. So being the very helpful and sharing person that I am, I have gathered five different family steamboat stock recipes from my close friends. Each with its own unique flavour – something spicy, something traditional and something nourishing. So this Lunar New Year, I have armed you with five different stock recipes, for five days of steamboat parties. And even if you have the same ingredients each time, I promise you will enjoy a different experience all together. So gather your friends and each can take on one recipe, because all five are worth trying! At the end of it all, let me know which you enjoyed best. Wishing you and your loved ones a prosperous Lunar New Year, and a wonderful time feasting with family and friends! This recipe is inspired by a wonderful hot pot session I had in Taiwan at a famous restaurant, Elixir Hotpot. The stock has many spices, herbs and dried longans in its shell, which give the soup a subtle sweet flavour. Although it is flavoured with many spices, the stock is not spicy hot. 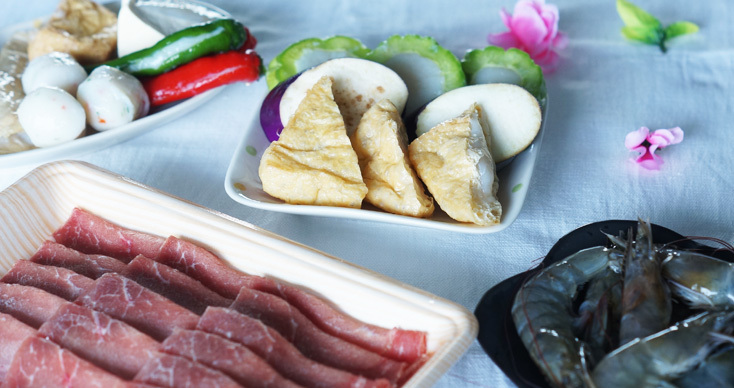 When used as a hot pot stock, the various vegetables, meats and seafood add wonderfully complex layers of flavour. Enjoy your Chinese New Year hot pot with this Steamy Mala Soup Stock! Boil all the ingredients in chicken stock for 1 hour. In Vietnam, this is referred to as Thai hot pot. 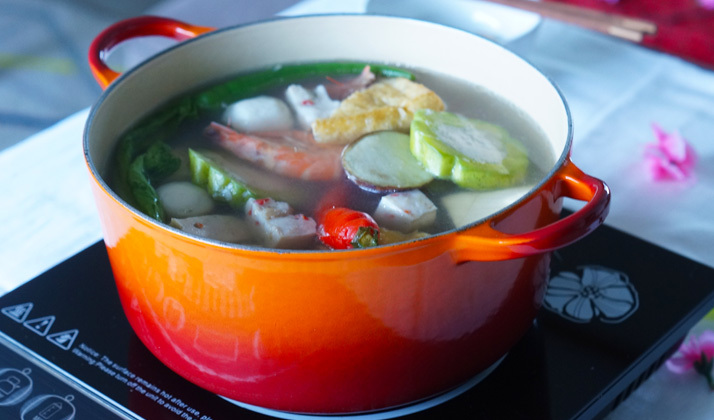 Perhaps the reason is that it originated from the infamous Thai Tom Yum Soup. You can choose to buy the concentrated sauce or make the sauce at home. Depending on individual’s taste, the ingredients may change, but the distinctive sour taste is its selling point. This is a great option for Chinese New Year steamboat, especially if your steamboat ingredients are mainly seafood. Prepare pork stock in a pot. Heat pan with 2 tsp oil. Add chopped onion and saute for 1 min. Add prawn heads,1 tsp salt and cook for 5 minutes. Add paste into pork stock. Using the same pan, add 1 tsp oil and add tomato pieces. Saute for 5 mins. Add 1 tsp sugar, fish sauce, chilli oil, chilli sauce, grated ginger and galangal with a bit of water. Cook for 5 minutes. Add everything into pork stock. After boiling the pork stock for 30 minutes, add chopped lemongrass, lime juice and lime leaves and simmer for 15 mins. Add some salt, sugar and lime juice to taste. Add blended coriander and culantro water into boiled soup and simmer for 15 mins. Sieve the pork stock to get clear soup. Add seafood, mushroom, vegetables and enjoy it with rice noodle! Chinese New Year Steamboat stocks can be fabulously complicated and layered offerings, or simple and clean concoctions, which are then left to take on the flavors of whatever you put into the pot. This is a recipe for a middle-of-the-road broth base, which is delicious on its own, and yet has the chops to take on bold flavors from the food that the family cook in it. It is a good mash-up of pork, chicken and seafood flavours with a refreshing root vegetable aroma. Blanch the pork ribs and big pork bones in a pot of lightly salted boiling water for a minute to a minute and a half. Strain and set aside. This helps to get rid of some of the gunk from the bone, but doesn’t cook out the flavours. In a stock pot big enough to hold about 5 litres, heat up the sesame and canola oil. Add the garlic, onions, and shallots and sweat them out over medium heat, around 3 minutes. Add chicken wings and chicken feet and brown them for about 2 minutes. Add pork bones and pork ribs. Saute for 1 minute. 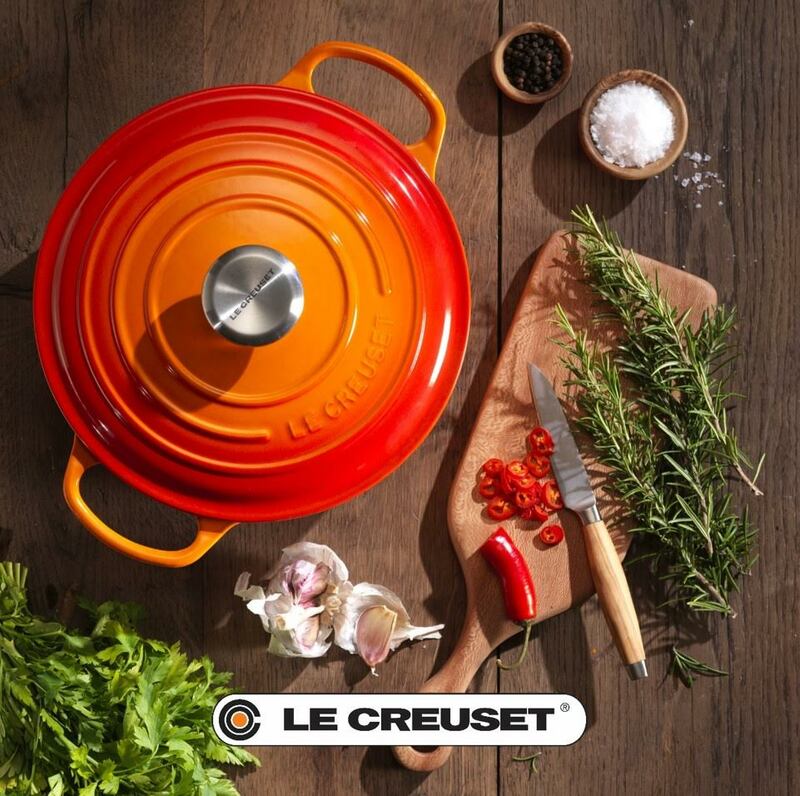 Add vegetables – carrots, leeks, celery. Saute for 2 minutes. Add sweet corn and the soup bag with the anchovies and cuttlefish. Stir in the condiments at this point – light soy, dark soy, fish sauce, orange peel and white peppercorns. Top up with 4 litres of simmering water, close the lid, and bring to a rolling boil before turning down to a simmer. Simmer for an hour. Strain the stock over a sieve and reserve the liquids. Refrigerate and use over 3 days, or freeze and store for up to a month. Other recipe by Jeffrey Yeo : Granny’s Chicken Soup. Broth without MSG is perfect soup! This was my original intention before Four Treasure was born and inspired by threadfin. Threadfin was introduced to me when I was a toddler. Mum would feed me and shared that threadfin was an expensive fish, rich in vitamins and provide DHA. Ever since a child, l love fish. Enjoy the freshness of this broth. 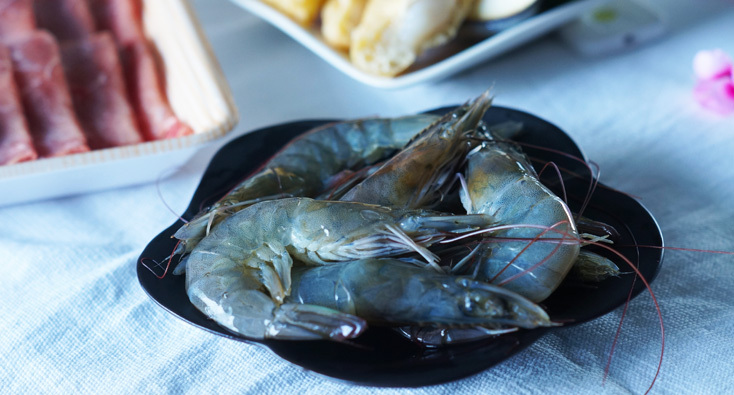 It brings a totally unexpected oceanic delight, perfect for Chinese New Year! Blanch the pork bones, fish bones and dried abalone separately. Add pork and boil for 10 mins. Add fish bones – garoupa first. After 3 mins, add threadfin bones. When it boils, put in the dried abalone, wolf berries and simmer at low heat for 20 mins. Season with rock sugar and a pinch of salt. This recipe is inspired by a Cantonese auntie, who is a very good cook. This stock is packed with goodness, mainly from the yuzhu. It is said to nourish lungs, treats dry cough and dispels wind, just to name a few. I like to prepare this stock and freeze it, so that I can take it out to use any time I need. Since Chinese New Year is a time of feasting, this stock for steamboat is a great option. You do not need many ingredients to get a nutritious stock. Boil all the ingredients in water for minimum 3 hours or more.